2016 will probably be remembered by SWF investors as a year of coping through chaos. Two major and completely unexpected political events, the Brexit vote in Britain and the election of Mr. Trump as US president, hit the “new normal” which we have been used to consider the prevailing regime governing global investments, with massive impacts on financial markets and geopolitical relations. In a low oil price scenario further stressed by heightened political uncertainty, SWF investments collapsed to pre-crisis record lows. In a context of subdued investments, the most interesting trends of the year is the increasing appetite for venture-capital style investment in technology and disruptive innovation. The bets that SWFs have taken in 2016 in this sector are astonishing, and the latest announcements suggest that the game has just started. The abrupt shift in the risk profile of their investments, from real, safe assets to the frontiers of venture capital, suggest that across the board SWFs are willing to play a leading role in the forthcoming Second Machine Age. Oil prices have fallen, during 2015, with crude prices closing the year at $35 per barrel, well below even the most pessimistic estimates. 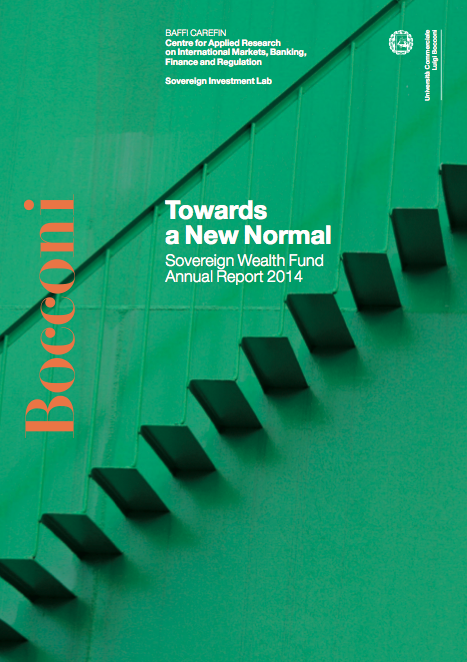 With roughly two-thirds of SWF assets originating from commodity revenues, this has had an impact on SWF funding. Yet, the sky is still up there—despite panicked reporting and predictions of their demise, our report documents that SWF AUM have actually slightly increased during the year, albeit at a slower pace than what we have been used to. For the funds themselves, however, these are defining times. Clearly, oil exporting countries are now faced with conflicting demands on their funds. Domestic budget shortfalls lead to the temptation to divest some long-term foreign holdings to provide liquidity domestically. On the other side, the diversification mandate of SWFs is now more important than ever. With commodity prices more volatile than at any point over the past decades, economies trying to diversify away from oil have incentives to pour more assets into their SWFs, not less. Hence, individual countries must now decide whether the primary mandate of their SWFs is short-term stabilization or long-term diversification, laying bare the inner contradictions of mandates that are often unclear. This report documents that most SWFs seems to be emphasizing long-term diversification, re-balancing portfolios towards illiquid assets, with a renewed emphasis on real-estate and a move away from low-yield, US markets. So, the sky did not fall. But, once the next crisis hits, SWFs will pay with their quest for yields with portfolios carrying higher liquidity risk. At that point, we will be hoping that cool heads prevail once more. Under the new normal, the global economy has fundamentally altered its growth patterns, with emerging economies converging to the level of more advanced countries. The two main engines of SWF growth – emerging markets exports and high energy prices – are today a spent force, and for the foreseeable future the inflows of foreign exchange reserves into (once) heavily exporting countries will continue to slow down. SWFs are trying to smooth the effect of falling revenues by pushing returns on their investments, tilting their allocation in favor of larger, and riskier equity deals, and even in their more traditional “safe and big” asset classes, SWFsare taking a more active, affirmative stance on corporate governance issues. But lower commodity prices and exports would not only reduce inflows, but also lead to increased domestic pressure on politicians to raid the SWF coffers to sustain thedomestic economy. As the Russian case clearly illustrates, SWFs will then be asked to act as “rainy day funds”, and this shifts asset allocations in favor of less risky, more liquid assets. The major challenge, which is also apparent in this year activity, will be solving the sovereign trade-off between financial returns and fiscal stabilization. In this game internal governance will be paramount: when the tide is rising, fuzzy, conflicting mandates and rules are easy to reconcile. But when the tide goes out, one discovers which SWF has been swimming naked. Emerging markets have enjoyed breath-taking growth over the past two decades by closing the productivity gap with the more developed economies. But, as the gap narrowed, growth rates have declined – and the slowdown of China and India has led to lower commodity prices. At the same time, the shale revolution in North American energy markets has put downward pressure – and future uncertainty – on the oil and natural gas prices that have underpinned much of SWF growth. This is why in 2013 not only have we observed SWF lower aggregate investments, but allocations have changed. The same slowdown that led to declining fund accumulations in developing countries has also led to the same markets being less appealing investment targets. We call this process the Great Reallocation, with implications across geographies and sectors. The biggest beneficiaries of this reallocation have been developed economies, primarily Europe, the United States, and Australia. Within this region, SWF selectively slowed down investment in manufactures indirectly exposed to emerging market growth, and focused on real estate especially commercial properties in Europe, and safe assets as infrastructure. SWFs are quite unpredictable but we tend to foresee this trend consolidating in 2014. In 2012, SWFs have been taking stock of previous experience. Stronger than ever, they realize the critical role they could play in the global economy and are embracing cautious change. After suffering huge losses in their investments in the financial industry at home and abroad, they have started to diversify away from banks both geographically and across sectors. They are paying more attention to deal execution, building in-house capacity to carry out investments and revoking mandates to external asset managers to save fees and gain efficiency. They are starting to play a more active role as shareholders, raising their profile in the corporate governance of target firms by appointing directors and thus benefiting other small shareholders. In order to assuage political concerns in recipient countries, they have started to work in close cooperation with local private and sovereign investors or in syndicates involving other international SWF as co-investors. Sovereign Wealth Funds (SWFs) had a vibrant 2011, completed 237 publicly reported, direct investments, with a reported value of $80.9 billion, the highest annual volume of reported deals we have recorded, representing nearly $34 billion (72 percent) more than the value of the investments we recorded in 2010. However, the funds' investment behaviour reflects deep mounting global economic uncertainties and a fragile outlook especially in the Eurozone. At home, SWFs continued to be called upon to bolster domestic banks' balance sheets; abroad the majority of their investments were in Europe and Asia, with an emphasis on the OECD. However, this was not a vote of confidence in advanced economies. Investments in Europe, developed Asia and the United States tended to be in safe-haven assets such as high-status real estate, infrastructure and commodities, or into companies with significant market share and growth potential in emerging markets. This enables funds to manage risk by getting exposure to emerging market growth, with developed market regulatory and political risk. On the whole, 2011 saw SWFs taking a more cautious approach to investing amidst considerable economic uncertainty. After building greater in-house capacity in 2009, in 2010 direct SWF investments appear to be more prevalent. This means that we can track more of their investments and create a more nuanced picture of their investment behavior. Consequently, it is likely that we will continue to see SWFs taking a larger number of smaller stakes. Previously, we were able to track only larger investments which were taken directly. Contextualizing our data in the current economic environment suggests that commodities and other alternative assets will become increasingly important for SWFs. Returns on many traditional asset classes are currently depressed and seem likely to remain so, particularly developed market equities and government bonds. With SWFs keen to make good returns for their sovereign government owners, it may well be that they choose to increase their allocation to alternatives as they look to realign their portfolios with new economic realities. In this vein, SWFs have turned their eyes toward emerging markets. Asia in particular and not just China, but also India, Singapore, Indonesia and Malaysia has received a large influx of SWF investment. Yet, Asia is not the whole story. Latin America, previously a geography in which we saw very little direct SWF investment, has become more popular with funds chasing alpha returns. 2009 opened to the most challenging economic and financial climate since the Great depression. With slowing income from plummeting oil prices and contracting global trade in 2008, the volatile investment climate made sovereign wealth funds (SWFs) more risk averse. The beginning of the year saw the lowest levels of publicly reported SWF investment for half a decade as they continued to be cautious actors in the global economy, scaling back their acquisitions to reflect their perception of increased market risk. This was exacerbated by SWFs suffering mark-to-market losses of an estimated $67 billion on their investments in publicly-listed companies by the end of Q1 2009, and some SWFs stepping in to bail out their countries' faltering financial service sectors. Since global markets first recognized the growing phenomenon of sovereign wealth fund(henceforth SWFs), these funds have been controversial. Initially depicted as scary new barbarians at the gate shaking the logic of capitalism, SWFs quickly turned into the white knights of Wall Street as the subprime crisis started to hit hard. The synchronic worldwide recession triggered by the market crash provided an automatic stabilizer of the global imbalances partly responsible for the rise of sovereign wealth, and today the funds are no longer seen as something to be dreaded and their activities no longer routinely make headlines. However, with assets worth more than $2 trillion, SWFs are likely to remain important sources of liquidity to a distressed global economic system.